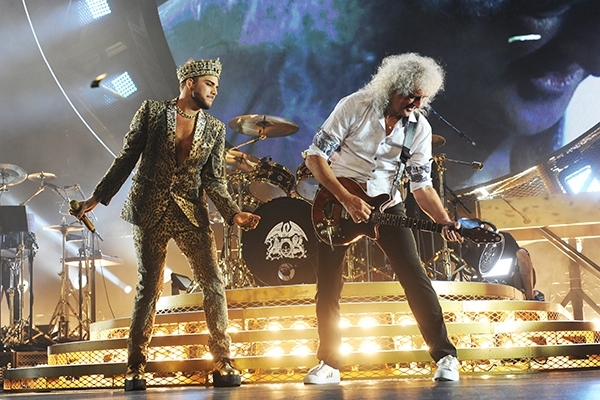 Queen + Adam Lambert Rock Wembley! You are here: Home / Tours and Live Performances / 2015 Queenbert / Queen + Adam Lambert Rock Wembley! Queen + Adam Lambert just finished playing Wembley Arena in London, home to some of the most iconic rock concerts ever, including Queen’s last appearance there for LIVE AID in 1985. Just like all Queenbert’s UK appearances, they slayed the audience and made them believers! Check out this article from TKG News. IT has been almost thirty years since Queen gave Wembley Stadium the 20-minute performance masterclass at Live Aid that sealed their status as rock legends. More soberingly, it’s almost 25 years since the death of the band’s flamboyant frontman, Freddie Mercury. For the last quarter century, celebrated axeman Brian May (now 67), and drummer Roger Taylor, 65, have kept the Queen juggernaut running – albeit with some bumps in the road. Now, they’re back in the Stadium’s baby brother Wembley Arena. Unfairly accused by some of cynically cashing in on Mercury’s legacy while bassist John Deacon opted for a quiet retirement, the duo have existed as a band for considerably longer without their flamboyant frontman than with him. Attempts to replace the irreplaceable have had mixed success – from duets with everyone from 5ive to Robbie Williams to Jessie J, to that long-term collaboration with ex-Free frontman Paul Rogers. All gave a new twist on the old standards, but largely failed to deliver the pomp and humour that made the songs so easy to love in the first place. So what of Queen’s latest collaboration with Adam Lambert, the former American Idol star who was just nine years old when Freddie passed? Thanks for the good review and kind words but Adam is not Freddie, he never said he was and he never tried to be. In my opinion he’s not Freddie… he’s BETTER! Yes, I said it! I’m tired of the comparison and more than ready for Adam to once again take center stage, headlining his own show, and OWNING the stage, front and center once more! Bring on his new music! I am so excited for this news. I hope they do more concerts in South America. I am having so much fun reading this every night. I didn’t want the collaboration to end. Great news! I just think Adam gave Queen a new shot in the arm. I saw the concert in Dallas, TX and I thought it to be ‘amazing.’ Just reading your article has me going to the bedroom to pack my bags again. Just a great concert PERIOD! Thanks for the news. How could anyone not like Adam with Queen? I also saw the Adam Lambert + Queen concert, I agree with the others that Adam has a voice like no other. He brought a tone and feeling to the Queen songs that had everyone wanting more. Adam’s voice, that face & body (Ahh..), had us asking for more. Ready for more Adam concerts and music.